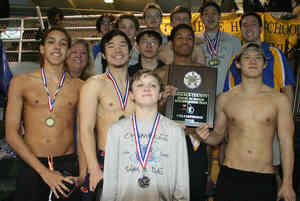 The Chamblee Bulldogs picked up two gold medals on the way to a third place finish at the 2015 State Swimming and Diving Championships. The Chamblee Bulldogs and Dunwoody Lady Wildcats made a strong showing in the Class 1A-5A State Swimming and Diving Championships held at Georgia Tech recently. The Bulldogs put on their second consecutive big performance by collecting, 269 points, to move up from a school best fourth place finish a year ago to third this year. Westminster finished third a year ago, but leaped to first with 309 points and Marist finished as the runner-up for two consecutive years with 293. Chamblee junior John Mitchell played a big role in 132 of his team’s points as he became just the second Bulldog swimmer to win a gold medal with his performance of 1:40.43 to take first in the 200 yard freestyle. He also collected an individual bronze medal with a third place finish in the 100 yard freestyle (45.55). He picked up his second gold medal of the meet as he joined teammates Jacob Jordan, Nick Oh and Noah Oh as the winning team in the 400 freestyle relay with a time of 3:07.72 to become the first Bulldog relay team to win a state title. Mitchell joined Jordan, Wesley Cheung and Patrick Lindstrom to bring home a bronze medal with a third place finish in the 200 yard freestyle relay with a time of 1:25.11. Christo Thames had a fourth place finish in the 100 yard backstroke (51.03) to pace Dunwoody’s tie for 28th out of 61 teams participating. Jackson Ford finished eighth in the 200 yard individual medley (1:56.01) and 11th in the 100 yard breaststroke (57.79) in helping Druid Hills to climb to 34th in the final boys’ standings. 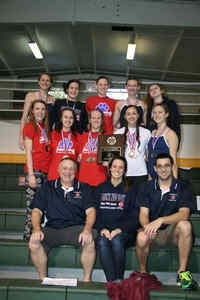 The Dunwoody Lady Wildcats moved up six places to fourth in the 2015 Class 1A-5A State Swimming and Diving Championships. The Dunwoody Lady Wildcats moved up six places in the 2015 state meet to take fourth with 192 points after finishing 10th a year ago. Allie Reiter had the best finish individually for Dunwoody with a silver medal winning performance in the 100 yard breaststroke (1:04.14) and had a hand in 94 of the Lady Wildcat’s 192 total. Laura Spratling had a fifth place finish in the 100 yard freestyle (52.55) and seventh in the 50 yard freestyle (24.26) while playing a hand in 112 points of the Dunwoody total. Spratling and Reiter joined Hannah Robison and Kaleigh McGrady to take second in the 400 yard freestyle relay (3:33.18) and fifth in the 200 yard medley relay (1:48.51). Emily Christensen picked up 13 points with a 10th place finish in the one meter diving event with a 353.65 point total to finish in the top half of the event. Caroline Olson finished sixth in the 200 yard freestyle (1:54.96) and 12th in the 100 yard backstroke (58.91) to team with Lauren Ford (13th in 200 freestyle, 1:56.40, and 10th in the 500 yard freestyle, 5:16.11) to put Druid Hills in the Top 25 of the 61 team field at 21st with 47 points. Chamblee came in 44th overall in the team totals with 15 points. The Lakeside Lady Vikings picked up 95 points to finish in the Top 15 (13th) of the Class 6A girls’ state meet in their first year in the state’s largest classification. All three Lakeside relays finished in the Top 15 led by the 200 yard medley relay team of Rachel Hu, Julia Shuford, Nicole Hollahan and Micah Damann coming in ninth with a time of 1:50.55. Shuford, Hollahan and Hu joined Emily Kleider for the 200 yard freestyle for 14th overall (1:41.83). Hu, Shuford and Hollahan added Julia Cartwright to the mix in the 400 yard freestyle relay to finish 15th (3:41.57). Julia Shuford had a 10th place finish in the 200 yard individual medley and 12th in the 100 yard breaststroke to add to the Lady Vikings’ total. Tucker’s Cash DeLoache was the top finisher in the Class 6A boys’ state meet with a sixth place finish in the 100 yard butterfly (49.79). DeLoache’s finish put the Tigers at 31st in the team standings with 17 points. Lakeside came in in a tie for 33 with 14 points with all coming from Kyle Bundesmann’s two Top 15 finishes. Bundesmann was 13th in the 100 yard breaststroke (1:00.90) and 15th in the 200 yard individual medley (1:58.12).